The dog days of summer, marked by the rise of Sirius, the Dog Star, are coming to a sultry, inevitable close. Sniff the wind — you can smell fall coming. But it’s not quite here yet and, lying in the grass at Glen Oaks Ranch ("field work" we call it in the Stewardship Department), my eyes are heavy and my mind drifts … thoughts of dogs lead to thoughts of other canids and memories of a grey fox I saw one afternoon near Stuart Creek. My eye caught movement under the buckeye tree where a handsome little guy popped out from under the bridge. He took a couple steps toward me and then sat down at the edge of the driveway just looking at me. And I looked at him. We remained that way for some time. Suddenly, he turned and scurried back down toward the creek. Delightful encounter. who puts the asset in grass? ​As residents of California, we have an extra special relationship to grass. We watch it paint the hillsides gold in summertime. We learn to live without it on our lawns. We have even legalized the use of psychoactive grass for adults. While the quality of one’s lawn or cannabis laws are both rich and riveting topics, I am not here to discuss grass in either regard. Today, I would like to bring to your attention the under-glorified yet inimitable grasses of the sea — and by that, I mean seagrass! 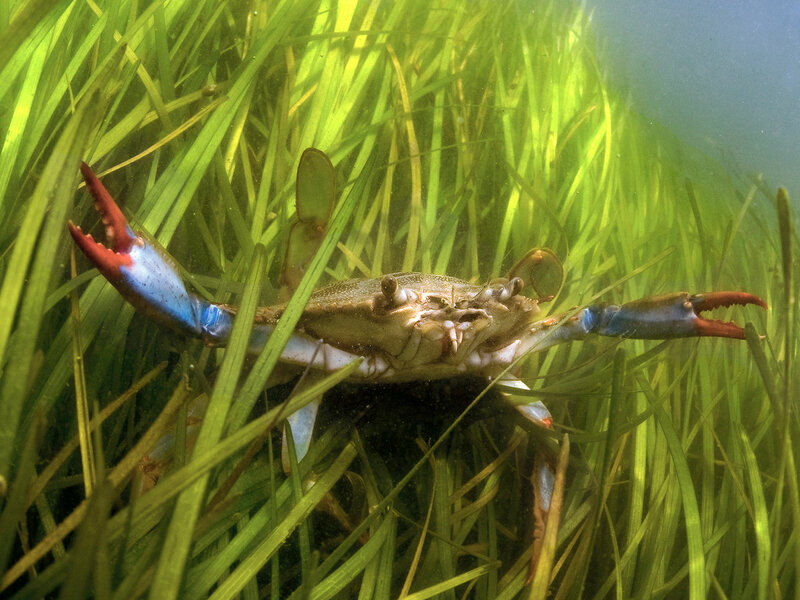 Seagrass beds, or meadows, provide essential habitat for marine life. ​Sonoma Land Trust holds conservation easements over 44 properties throughout Sonoma and Mendocino Counties, eight of which were impacted by the fires in 2017. We have a special relationship with our conservation easement landowners: Through their stewardship on their privately-owned properties, they help further our mission by preserving and protecting some of the most unique and important landscapes throughout our county. We’ve been working closely with our CE landowners whose properties were impacted by the wildfires by connecting them with local organizations, state agencies and professional colleagues that specialize in the ecological impacts and restoration of fire-affected landscapes. We continue to monitor the properties closely for fire related changes to the conservation values and, if requested, assist the property owners during the ongoing recovery process. Across the country, far from the where the future of the Act will be determined, we at Sonoma Land Trust have a vested interest in one small — but important! — endangered plant species: the white sedge. White sedge (Carex albida), was previously thought to be extinct until it was identified in 1983 at Pitkin Marsh, an environmentally significant wetland located between Graton and Forestville. The Land Trust owns a portion of this marsh, 27 acres worth, of which is home to the only known population of white sedge.